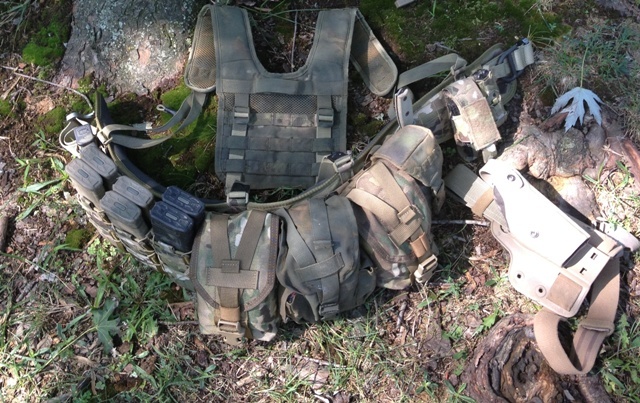 Last week, MVT posted up a video talking through his current fighting gear / load bearing equipment, which includes a new chest rig made to his specs. It also includes a pretty cool first person run through a shooting scenario - worth paying attention here to pick up on some of the tactics/techniques that Max teaches. 10-12ish mags, handgun, 4x canteen pouches on the back and a couple handgun pouches to round it out. We'll call it a "British-style" battle belt for lack of a better name. I toyed around with a British battle belt, similar to Max Velocity's, through part of last year. Went cheap on the belt - got a Condor knock off and their harness, bought a few surplus USGI canteen pouches and used pouches that I had lying around to cobble one together. Found a lot to like about it - way better load carrying ability and generally more comfortable / better mobility than a comparable weight of chest rig. Gives you the ability to carry a decent amount of food, a canteen, survival gear and a big IFAK, which can be a challenge using other load carrying gear. Good place to put your sidearm and good access to it. Easily adjusts to different weights of clothing, too. After a bit of T&E, I ended up giving up on a British-style battle belt for my purposes, at least for the time being. Why? The big deal breaker is operations in/around vehicles, and to a lesser extent moving through structures/room clearing. Canteen/utility pouches on the back and triple-thick mag pouches on the hips extends your width pretty significantly and you start having to turn sideways to get through doors, can't sit in a normal car comfortably, etc. There's also no lighter/low threat profile to choose from with just the heavy belt. A lighter battle gives you the option of operating with just the lighter, more comfortable, lower profile belt on. Options and flexibility are good. Of course, this isn't exactly a revelation--Max's heavier weight battle belts were a bit of an outlier in the tactical gear world. Folks have been running lighter battle belts in conjunction with a lighter chest rig or plate carrier mounted pouches for a while. I have most recently been settling on using a light battlebelt, which is comfortable enough to wear most of the time, augmented by a chest rig. I feel that this is the most practical application across operational environments; it works well for both dismounted operations, vehicle operations, and with or without armor. 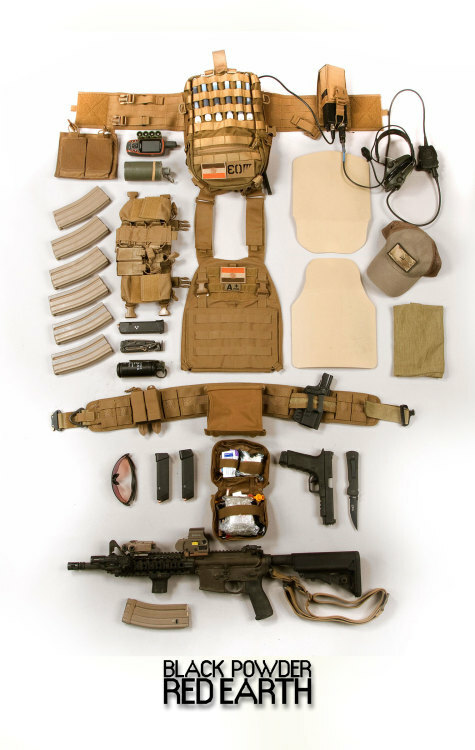 This matches my own personal assessment after running a variety of gear - plate carriers with pouches directly attached, stand alone chest rigs of a variety of sizes, 'British' battle belt, etc. I'm currently mid-process of re-building my kit to incorporate three different layers - light battle belt, chest rig and slick plate carrier. In conjunction with concealed carry/daily carry gear, these standalone pieces give you the flexibility of different profiles to address different situations. Slick plate carrier and CCW if anticipating potential trouble but need to maintain low profile. Light battle belt for running drills on the range or hunting. Throw it all together if the Nazi Zombies are at the front gates. Chest rig and carrier are sorted out - HSP D3CR and a Velocity Lightweight Plate Carrier. I may down the line drop some coin on a custom rig from Extreme Gear Labs, designers of the D3CR, but generally the stock D3CR does what I need it to do. Looking forward to a couple of the enhancements HSP has in the works this year. The ability to directly attach the D3CR to the carrier, or run it as a standalone rig is money. Battle belt is a work in progress - ideally want pistol, pistol mags x2, 2-3 rifle mags, dump pouch, IFAK, H2O of some variety, flashlight and multi-tool. Maybe comms, too. Not sure if I can manage all of that with the given real estate, but we'll see. Follow up posts/reviews are incoming. In my experience, most people are continually tinkering with/adjusting their gear. Trying new things, incorporating new ideas or revisiting old ones. Travis Haley makes a big emphasis on preaching the importance of staying dynamic and adaptive...and at worst, adjusting and evaluating what you're doing exposes you to different ideas and keeps you on your toes. Interested to hear from the tribe - are you tinkering with your battle rattle? What gear ideas have you tried out recently and left by the wayside?